Measurement of particle beam intensity distribution versus time (= measurement of bunch structure at rf-accelerator). Bunches are stopped on the inner conductor of a beam stopper which is part of a matched coaxial transmission line. The current signal is transferred (bandwidth 2 GHz) to a subsequent broadband signal-processing system. For suppression of secondary particles, influenced fields (for cases in which ‘v’ particle is less than ‘c’), and for shielding against rf-noise, a grid is provided in front of the beam stopper itself. 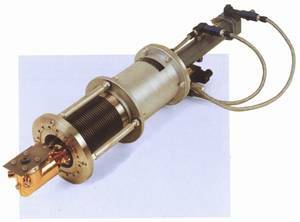 The coaxial faraday cup can be moved into beam by means of a compressed air actuator/linear vacuum feedthrough.